MKG127 is pleased to present Imaging Saturn (Oppositions 2011-2040) by Risa Horowitz and in the front space,Twins by Ryan Park. Opening Saturday February 16 2-5 PM. 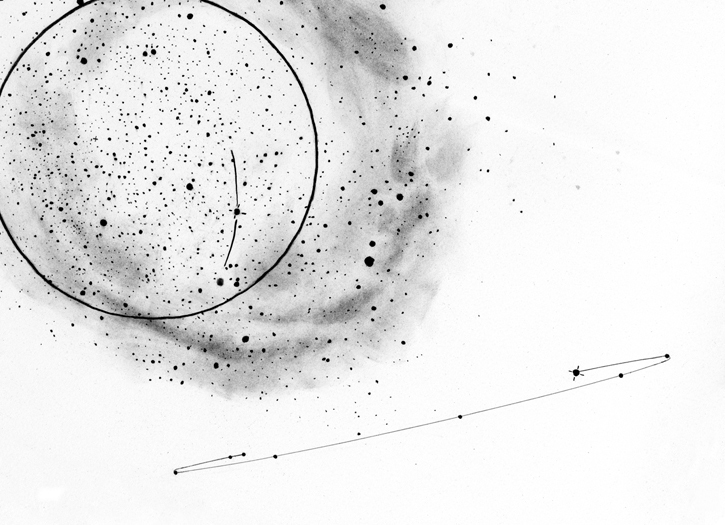 For her third solo exhibition at MKG127, Risa Horowitz presents her ongoing research as a novice amateur astronomer and astro-photographer, and her first collection of drawings. The work arose from her experience of seeing Saturn through a telescope for the first time in May 2010 – a profound and sublime personal experience that raised questions about the incomprehensible scale of the universe and our ability to make sense of that scale in concrete or intuitive ways. Horowitz will capture one photograph of Saturn through a telescope for each year of the planet’s orbit around the sun: 29.42 years, with images from 2011 and 2012 included in the exhibition. The suite of 29 drawings depicts Saturn at three fields of view, at midnight on the day of its opposition – its nearest annual approach to earth, directly opposite the sun – from 2011 to 2040. Risa Horowitz recently relocated to Saskatchewan where she is assistant professor in the visual arts department at the University of Regina. Her work has been exhibited across Canada in a variety of public galleries and artist-run-centres, as well as internationally in Australia, the United Kingdom, and the Ukraine. Horowitz has received numerous grants from the Canada Council for the Arts and several provincial funding bodies, and was the 2006 recipient of the K.M. Hunter award for excellence in Visual Arts.. Work from the Imaging Saturn project is also currently being exhibited at the MacKenzie Art Gallery in Regina (until April 2013).